Why are monarch butterflies disappearing? Scientists are racing to find answers. Come along on a quest to discover what scientists already know—and what they're hoping to learn. Hirsch introduces the mysteries of monarch butterfly migration while encouraging readers to get involved to halt the butterfly’s population decline. The author recounts how scientists developed tagging methods to track the path of eastern monarchs and to identify their wintering grounds in Mexico. After explaining the generational life cycles required to complete the yearly migratory journey, she devotes much of the book to hypotheses about why their numbers have dropped dramatically. Among them are reduced forests in Mexico, declines in milkweed and other wildflowers along flight paths, climate change, and displacement of native milkweed by tropical species, pesticides, and herbicides. She explains how citizen scientists, including children, can participate in studies and create monarch habitats to aid butterfly survival. The included suggested books and websites reinforce the recommendations. Hirsch packs a lot of information into this volume. Her clear, conversational presentation differs from the texts in two of her previous books about monarchs (Monarch Butterfly Migration and Monarch Butterflies: A Generational Journey). Older readers, including adults, who want additional information and activity suggestions for home or classrooms might consult Kylee Baumle’s The Monarch. VERDICT A fine choice for most public and school library collections, particularly those that promote active engagement with the natural world by citizen scientists of all ages. What’s the mystery about monarch butterflies? For many years, scientists wondered where Eastern monarchs (those east of the Rockies) went during the winter. But not until 1975 were their migratory destinations discovered in Mexico, where they cluster on oyamel trees. Today there’s a new, more vital question: Why have monarch populations rapidly declined in the past 20 years? Hirsch’s research includes interviews with scientists studying monarchs and the many factors affecting them. In a well-organized and clearly presented account of current knowledge, she introduces the diet, life cycle, and migration patterns of this familiar species, as well as theories about known threats to its survival. Besides the effects of climate change and the loss of oyamel forests and milkweeds plants, these include increases in disease and in pesticide use. Each double-page spread in this large-format book includes at least one illustration, usually a well-chosen, colorful photo, but sometimes a map or chart closely related to the text. 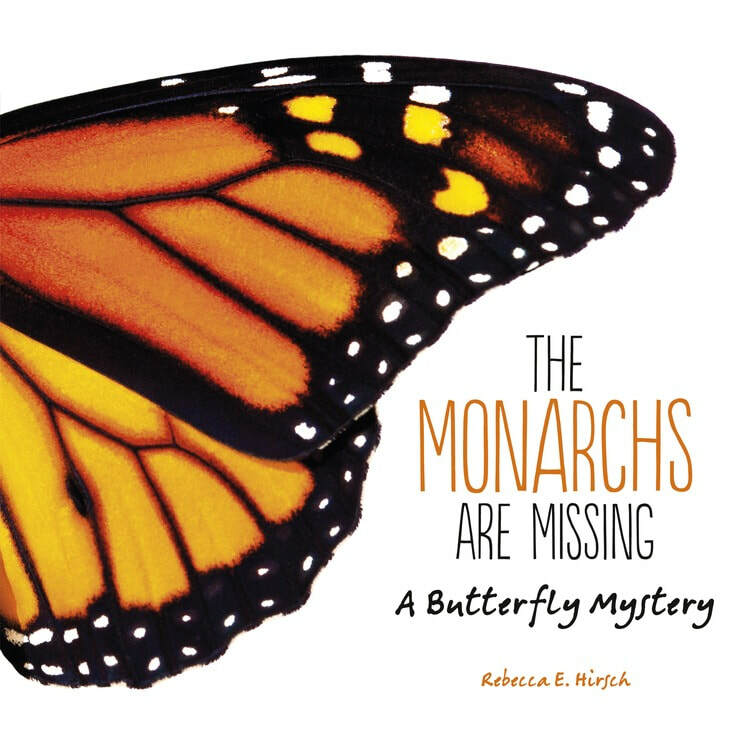 The book offers some hopeful news, while encouraging readers to become citizen scientists and actively help monarch conservation efforts. Scientists and citizen scientists investigate monarch butterflies. The first question was where the butterflies went in the fall. After the discovery of their wintering colonies in the oyamel forests of Mexico, the question changed to why their numbers have dwindled. Scientists point to a number of possible causes: weather variations and climate change; habitat reduction; herbicide use that has reduced the population of milkweed, where monarchs lay eggs and their caterpillars feed, and other wildflowers, where adult butterflies feed during migration; widespread use of neonicotinoid pesticides; and the rise of a disease due to garden planting of a winter-blooming milkweed species that encourages the butterflies to overwinter in Southern states. Hirsch, a former biologist and graceful science writer, explains the monarch life cycle and its complex migration clearly, setting the stage for her exploration of the many mysteries that still surround the population's ups and downs. She stresses the hopeful fact that monarchs can bounce back relatively quickly, because they lay so many eggs, and she offers realistic options for readers to participate in research and to encourage butterflies. Her clear explanation is attractively presented, illustrated with stock photographs of butterflies and some human researchers (of varying ages and ethnicities) as well as with occasional appropriate charts, all supported by extensive backmatter. Sadly, the index is skimpy, a disservice. An excellent introduction to a familiar scientific puzzle.